This is my last post for 2014! It has been an amazing year! 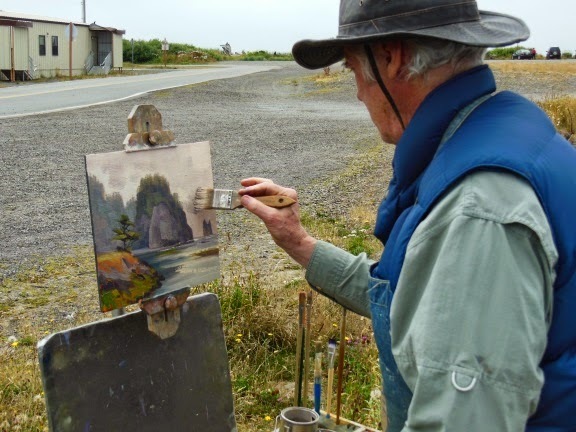 Full of plein air adventures , meeting new friends, painting spectacular scenery up the west coast into California and all the way to the Baja peninsula! I feel incredibly blessed to have the ability to pursue my love of art, full time! My advice is to find what you have been gifted and called to do and then get out there and work towards making that your lifes work. Sometimes you have to work other jobs until you can get there but never give up! 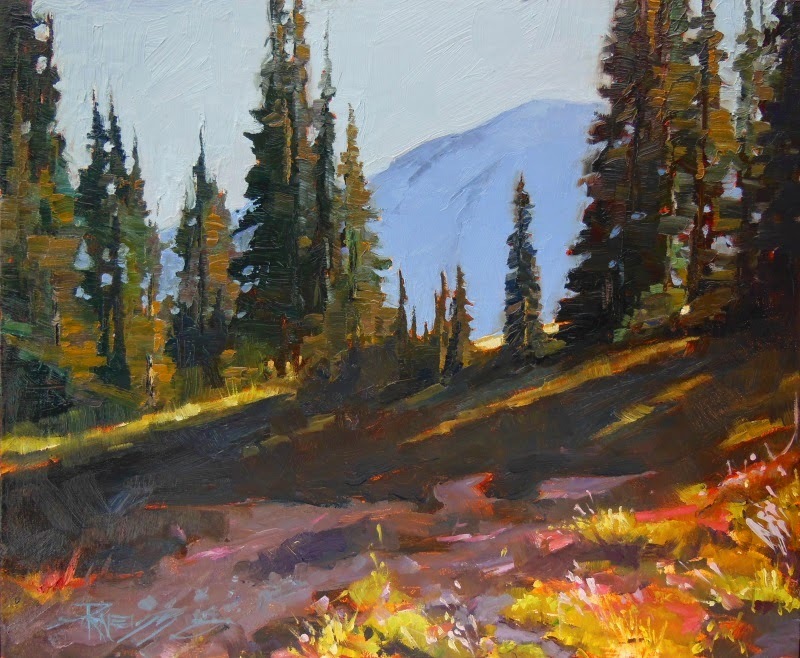 This painting is from one of the photos I took a few years back of a hike up to Grand Park in Mount Rainier National Park. Another Washington location of spectacular beauty! May your year be filled with love, joy and adventure! Happy painting and hope to see you down the trail! I'm posting this painting just before we walk through the woods to my moms house to open our presents on Christmas morning. This is a gift for my wife. She won't see this post until after opening it. I'm excited to see her face. Our grandchildren bring much joy to our lives but this morning I'm thinking about the great joy of Christmas that came wrapped in a manger in Bethlehem. I'm hoping that you all will know the peace and joy that comes through faith in Jesus and the message He brings of love and redemption. 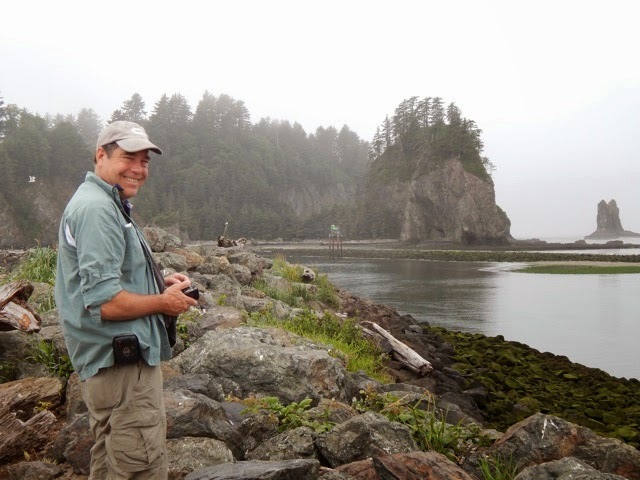 Our scouting trip also included a stop at the Quilute village in La Push. 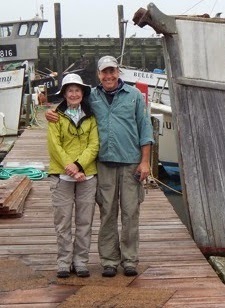 There is a great marina there where the native fishermen take their boats over the bar every morning. 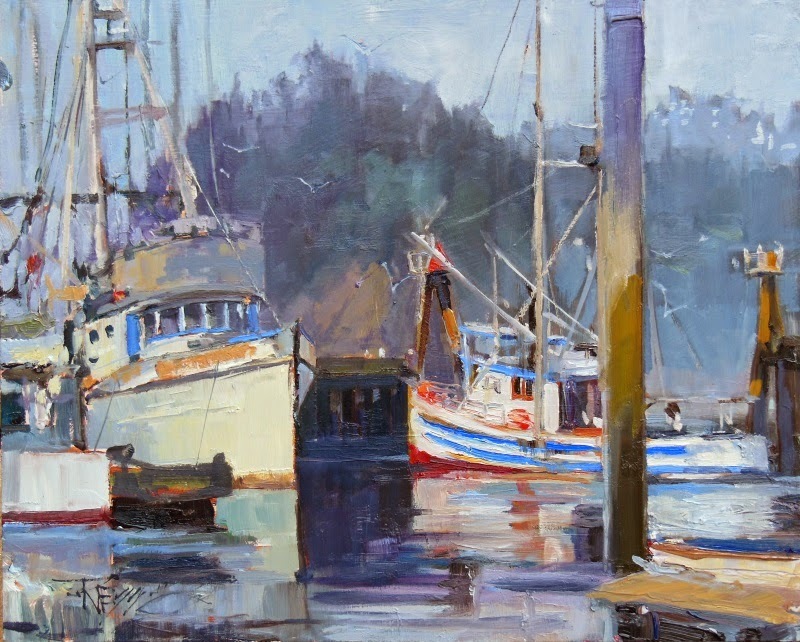 I decided to paint the marina while Jim was painting the great sea stacks just outside the harbor. 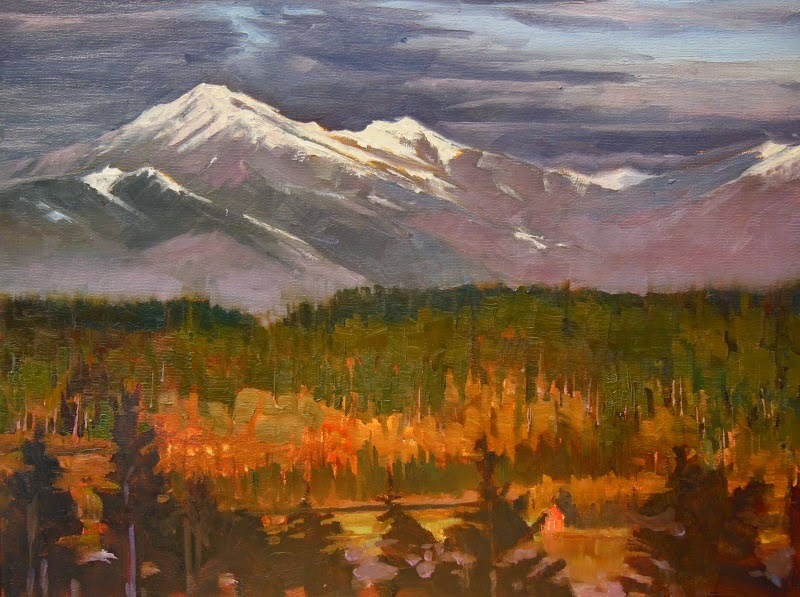 The fog softened the edges in the distance and lent a nice mood to the paintings. I added a second boat to my composition after coming back to the studio thinking it needed the balance. I guess that was a good move since the painting sold during the studio tour. One of the places that Anne Dalton took us was up the Hot Springs road to a spot called the Salmon Cascades on the Sol Duc river. A location with a good view of the actual cascades didn't work out due to some young people having a lot of fun diving and swimming in the lower pools. 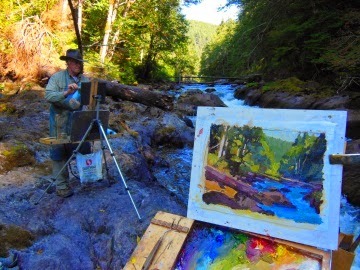 We did find a good spot above the cascades and took some extra time to do a quick painting. 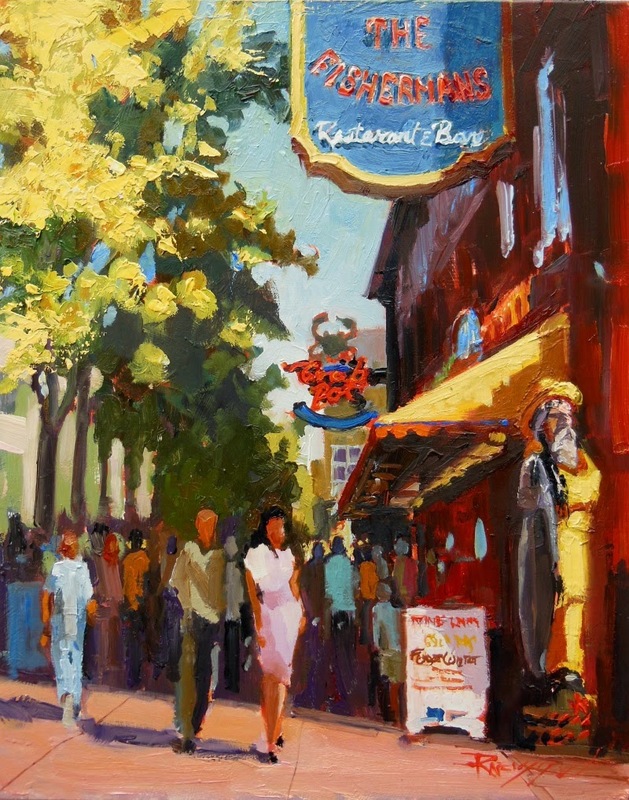 My paintings and experiences at Paint the Peninsula are recorded in earlier posts. I scoped this spot out on my way to Alki Arts one afternoon and thought to myself it would make a great painting when the sun is just right. I came back early enough to set up before the sun was the way I wanted and grabbed a slice of pizza. FYI , right across from the El Malecon is a great little pizza joint with tables outside in the alley. That's where I set up my easel. 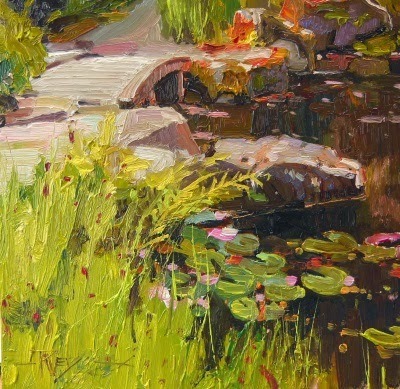 This is the plein air study I did that sunny afternoon. 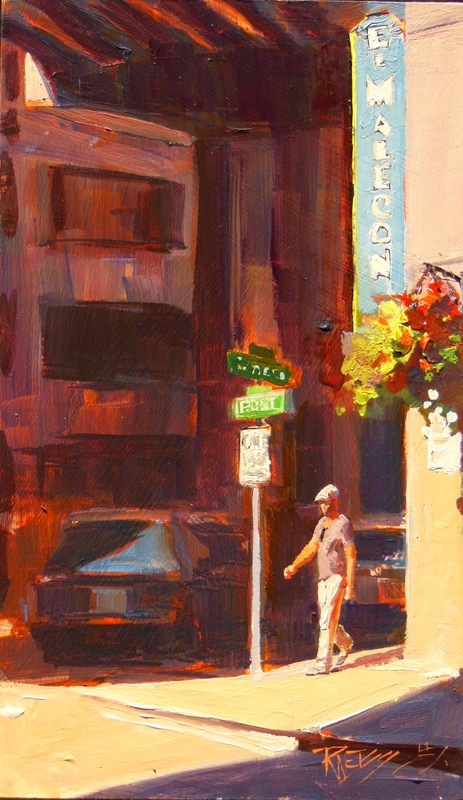 The above painting is a larger studio painting with the figure of the walking girl added from photos taken on location. I'm really starting to love painting in the city! FYI Malecon means Seahorse in Spanish =] The food there is good too! 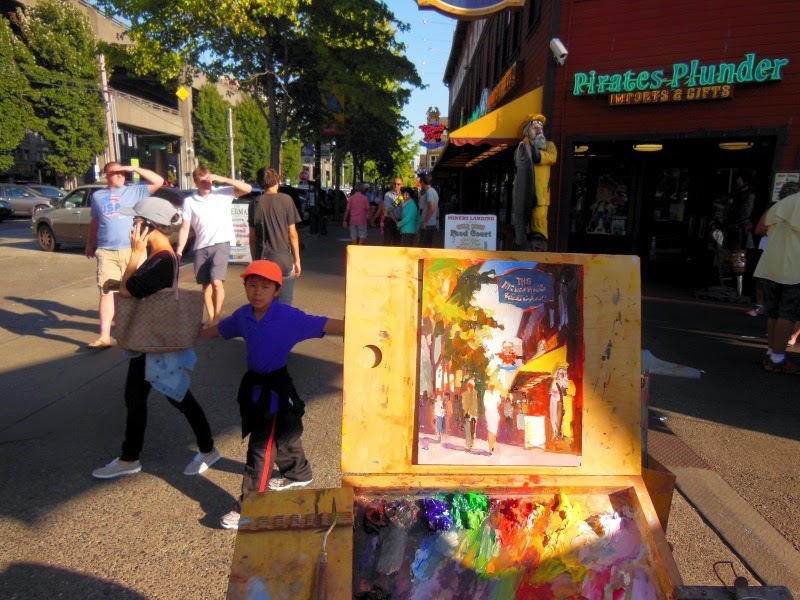 The plein air painting is available at Alki Arts located at First and Seneca, downtown Seattle! Call Diane and she will ship it right out to you! I had a blast painting this scene while waiting for the family to arrive. We were celebrating several birthdays by having lunch on a beautiful, sunny day in the city. The Fishermans Restaurant has a spacious deck out back, right under the new , giant Ferris Wheel . I went back to this spot three weeks later and all the trees had been torn out and the street ripped up as workers dug a giant pit twelve stories deep to recover and repair the boring machine which was disabled while trying to build the tunnel to replace the aging viaduct. The scene I painted will never look like that again. 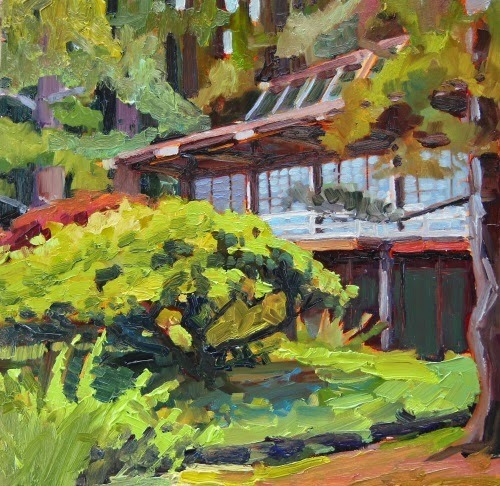 While we are on the subject of the Bloedel Reserve , here is another one done on location in the Japanese Garden area. 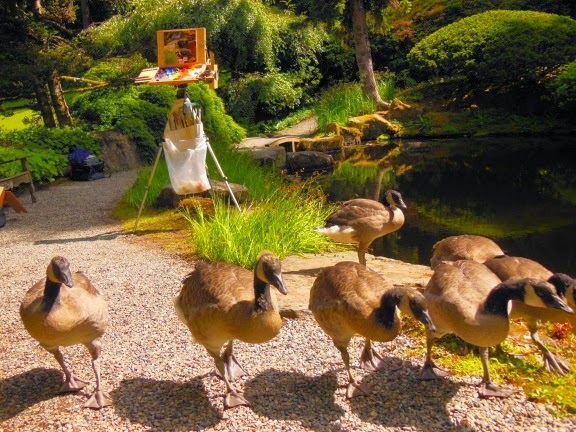 The Bloedel Reserve is an amazing garden and grounds not far from us on Bainbridge Island. I have painted there quite a bit, in fact I have painted there so much they are now showing my paintings of the reserve at the gatehouse! 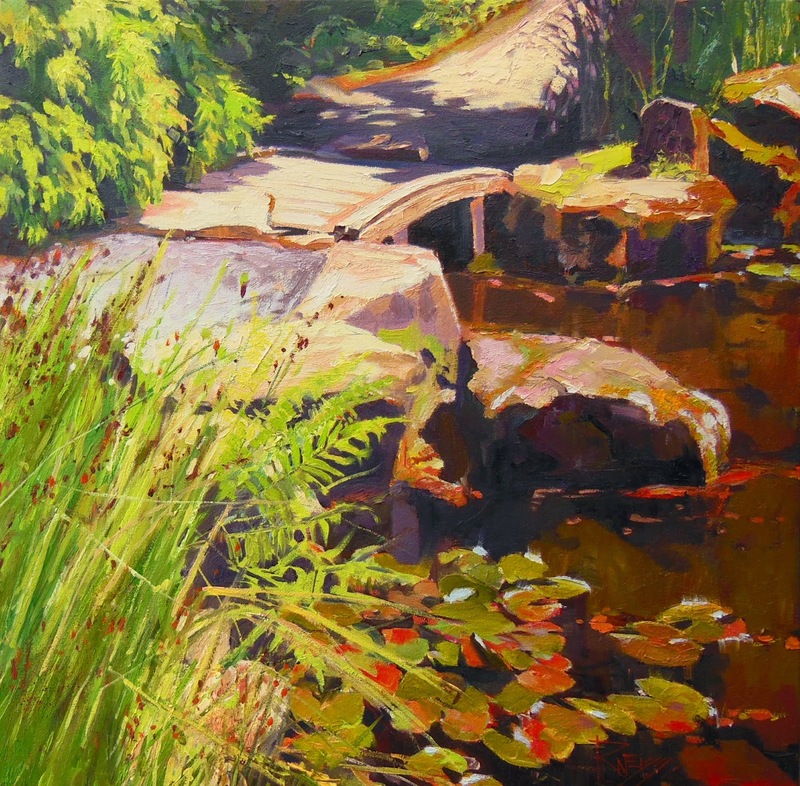 I was invited to join my friend Darrell Anderson and some other painters at Bloedel the first time I painted the footbridge. We had a wonderful day in beautiful sunshine. We all set up around the Japenese Garden area. The local gander even stopped by to check it out. These geese were so friendly they walked right by us as we were sitting on the path! 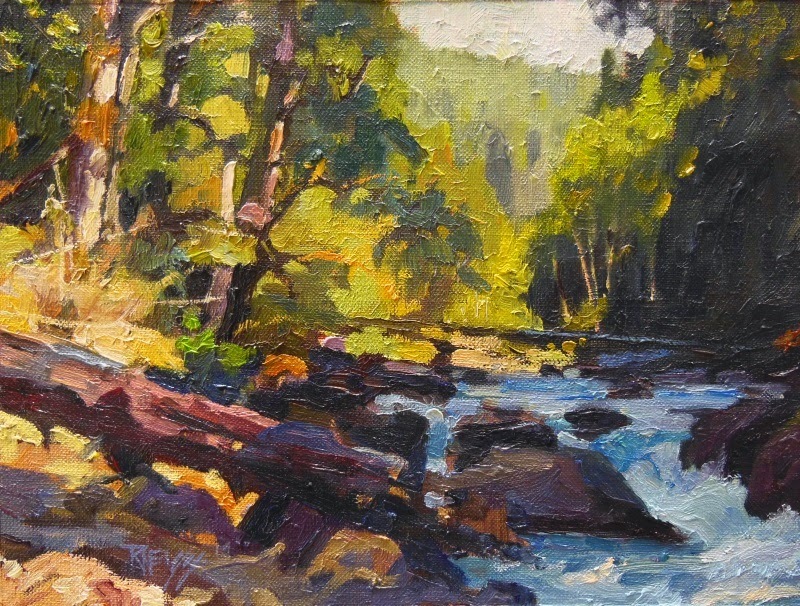 I liked the little painting so much that I decided to use it as my study for an upcoming show called "Natures Gift of Water" sponsored by Plein Air Washington Artists and exhibited at the American Art Co. in Tacoma WA. 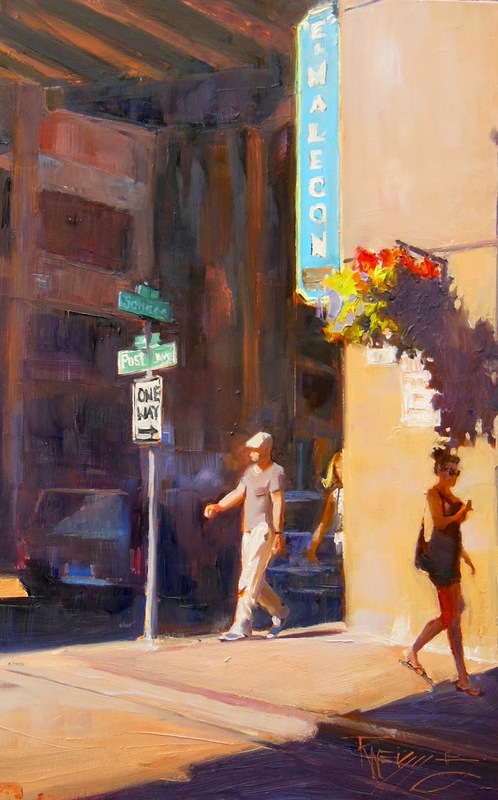 This show features plein air paintings and studio paintings derived from the studies. Available at The American Art Co. Since the requirement for the show was at least an 8x10 plein air study I had to go back and do another plein air (top one). I then used that study to paint this larger studio painting. 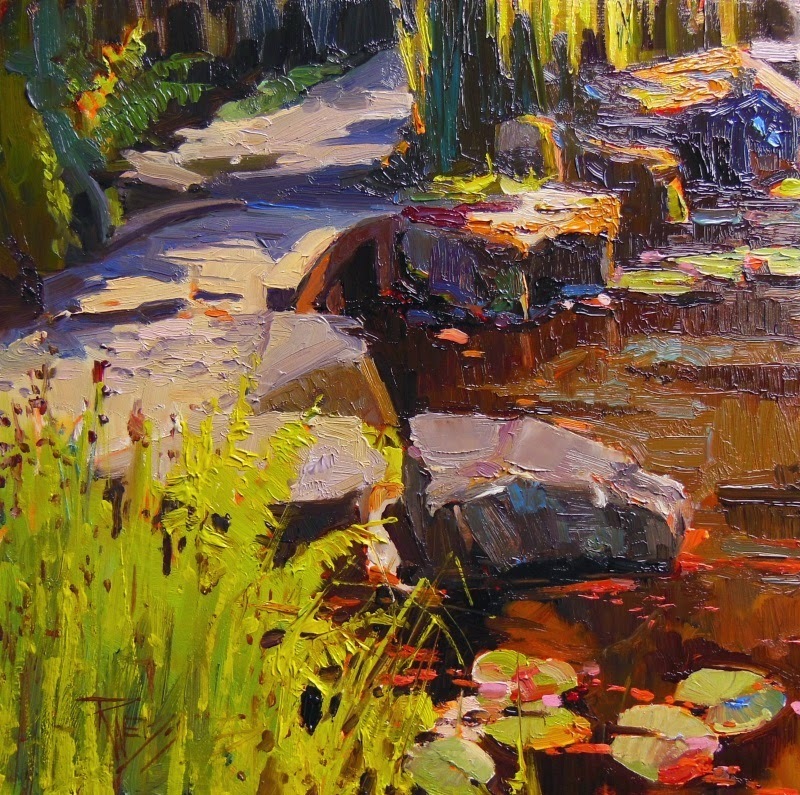 If you have never tried going larger with your PA studies you may not realize how difficult it is to get the same spontaneity and freshness of brushwork. It's tough! It was an honor to meet and receive an award of honorable mention from awards juror Jeremy Lipking for my plein air study. 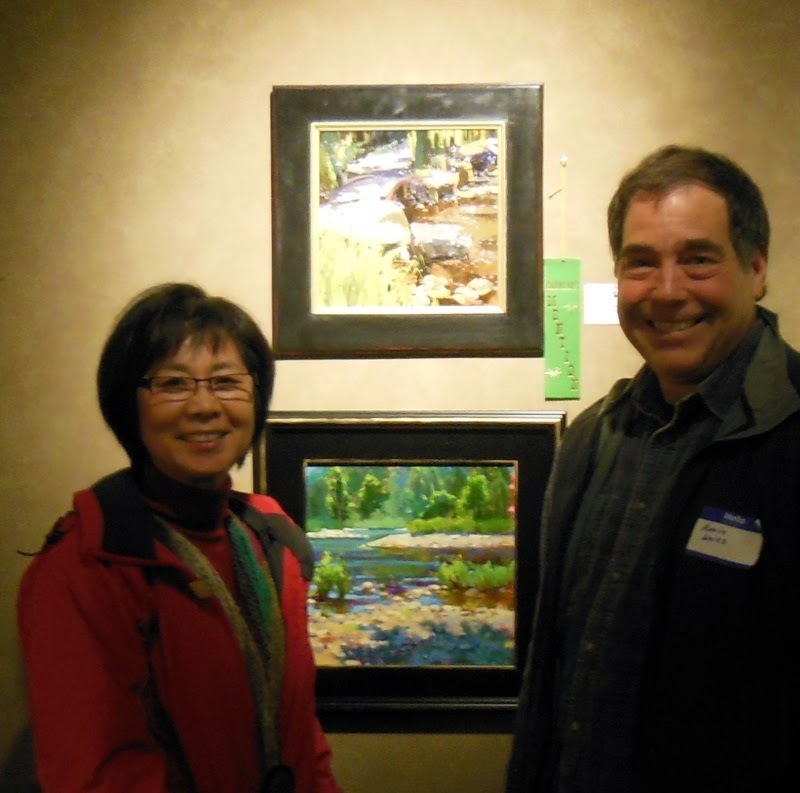 And then to top the evening off I sold the painting to fellow artist and collector Mami Shimomura. This was another commission request of a favorite view and happy memory during a period of time in a place much loved by the family. 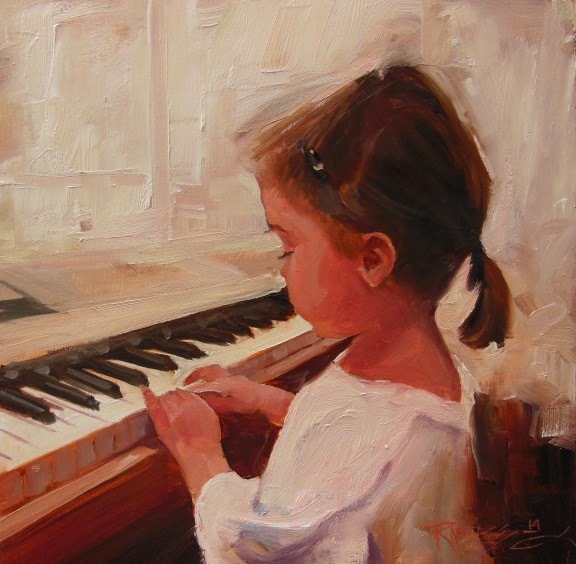 Rob, the painting arrived a few minutes ago, and it is just breathtaking! I am so excited, and can't wait to give it to Chris. I guess it's a pretty selfish gift because I know I will get every bit as much enjoyment out of it as he does. I hinted to our former landlords that a surprise was coming their way, too (I am going to give them some of the note cards), so your gift will go out to Maine as well! You're a bi-coastal artist now. :-) Thank you again. Good things seem to come in bunches like bananas and this month it was commission paintings . 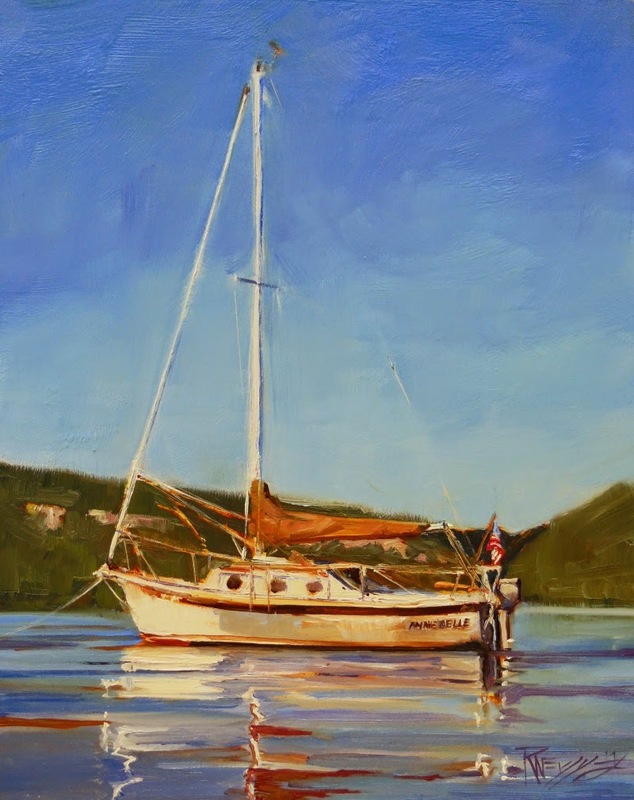 Christy Crider thought a painting of her friends sailboat would make a nice gift. She sent me some photos and I did this painting for her. The package arrived right on time on Monday and it is much loved by its owner. Thank you again. It was a pleasure to work with you.